Towards the southern edge of the Bloomington river bottoms trail there’s a bridge that takes you across the Minnesota River. Right before the Bloomington Ferry Bridge you’ll see a rocky slope that travels down into the woods. This slope is the start of a great adventure. 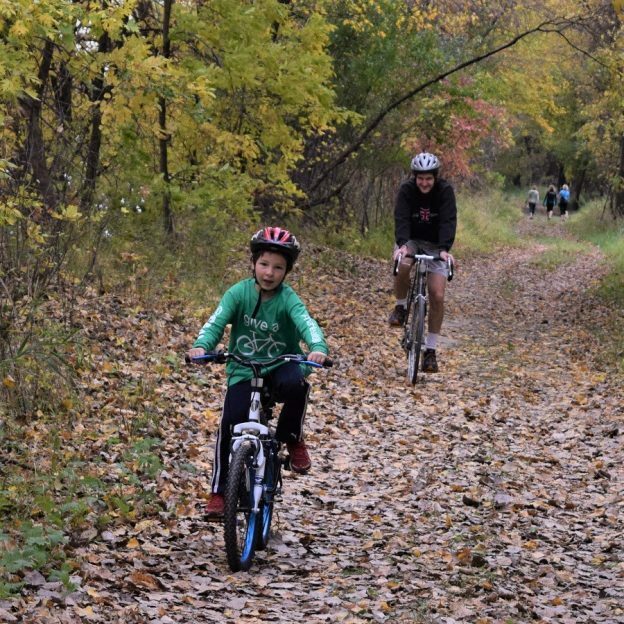 It’s known as the Minnesota River Bottoms Trail. Now, you may worry that you can only ride with a mountain bike on the singletrack trail, but you are safe on a regular trail/path bike also. You just have to watch where you’re riding. The ride itself is fun and challenging. The trail is made out of dirt. While it may be smooth riding for the most part it’s not immune to the unpredictability of Mother Nature. Pedaling along you may come across places that are soft and muddy from a recent rainfall. Not only that, but this trail is used pretty regularly so you’ll see other tire tracks that have gone through and made the puddles deeper and muddier in the aftermath. Usually you can ride through or ride around it. If you ride through, you may feel your tires slip but as long as you keep going you should be fine. Riding around the puddle will take a little more concentration. You may either be able to find a dry area around its perimeter where your tires can fit or an area that hasn’t been touched. The Minnesota River Bottoms is not only a great place to ride Fatbikes, but the birthplace of them. For most of the ride you’ll be along the river with a few trails leading you away. You’ll come upon many obstacles as well, such as logs set up for you to ride over if you wish and different turns that will keep you alert. Small trails will split off the main path and take you to other scenic areas, but usually connect back to the main trail eventually. 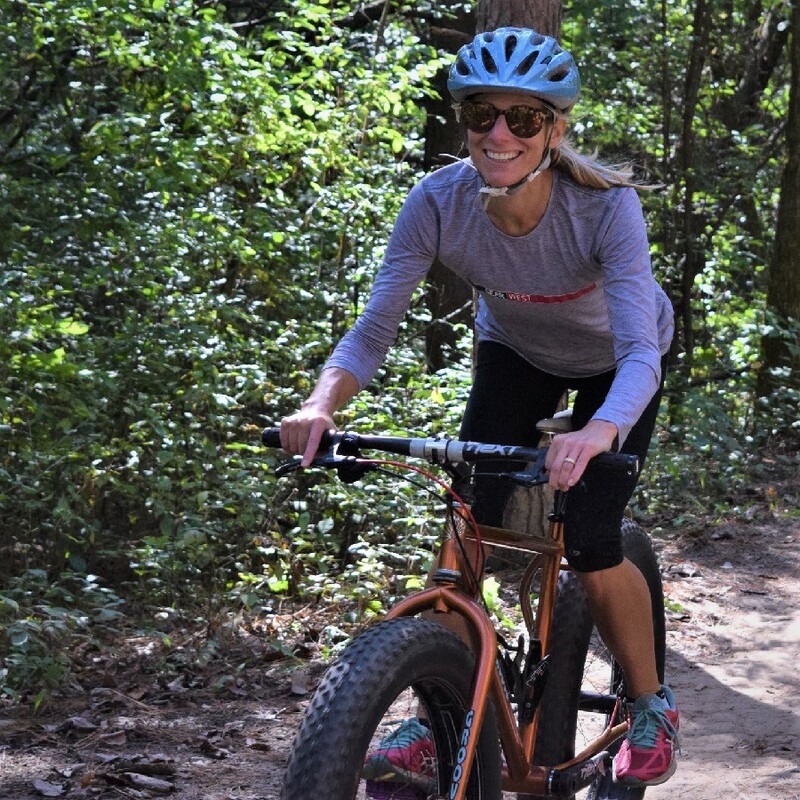 While the trail is mostly flat, the sandy conditions can make it hard to pedal. Also, the trail often changes shape after the river floods which makes for unique rides! 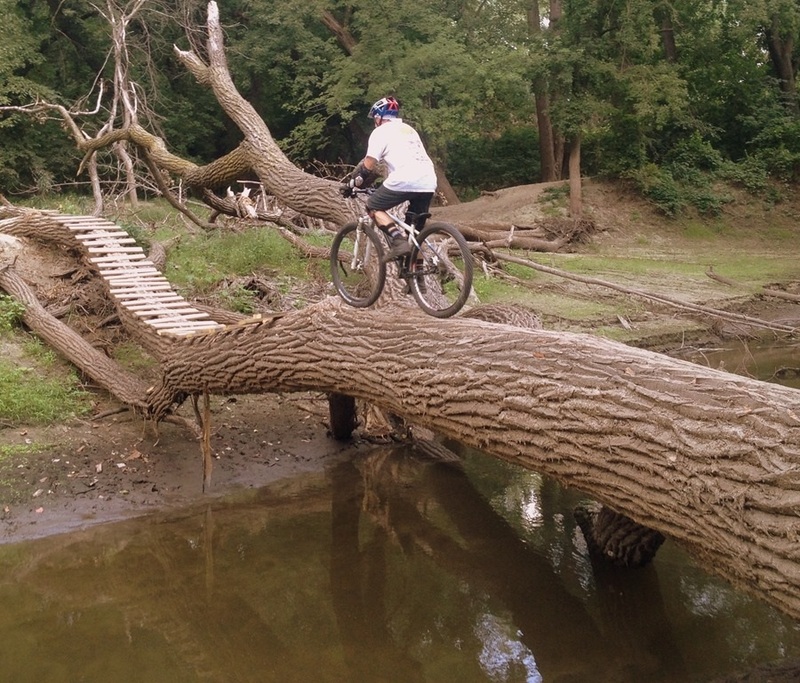 Here is a fallen branch that acts as a bridge crossing the Bloomington’s river bottoms. You’ll find a few opportunities to cross the tributary streams that feed the river. One is a wood bridge that’s also partly on a fallen tree branch. You can certainly try riding across and risk falling in, or you can carry your bike across. There’s also a floating dock that allows room for you and your bike. 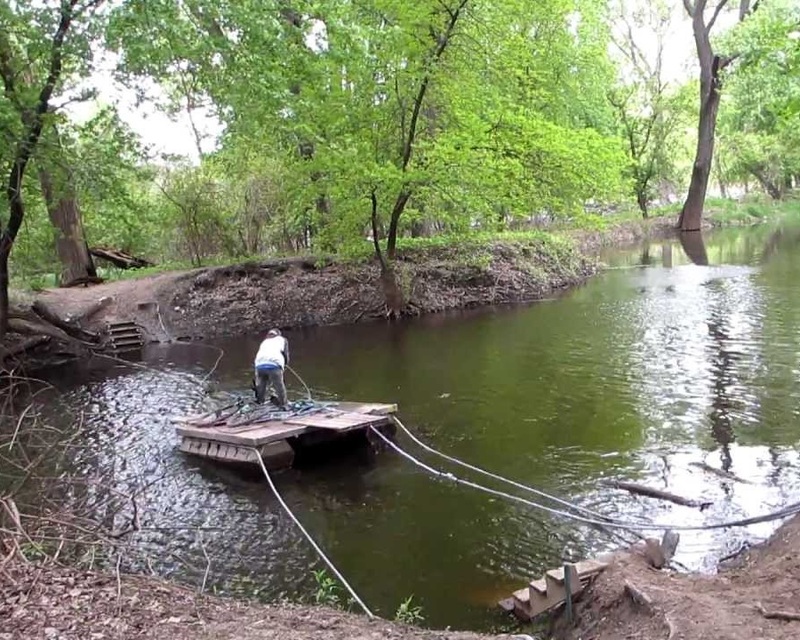 You’ll use the rope to pull yourself across the river so you can continue your ride. Why the trail is fun! It takes a little more concentration than paved trails, but the uncertainty of what you’ll encounter is all part of the fun. On a paved trail you can have plenty of fun with the different twists, turns, climbs, and descends. You’ll even have plenty of views to stop and look at. But this track is different. While it is maintained, the trail gives you the feeling of being unprotected. It’s just you and the elements. There will be plenty of debris on the trail, and more than a few low branches that you’ll either have to dodge or be okay with them hitting you in the face. And winter biking is always fun on the Bloomington River Bottoms Trail. Find out more about Bloomington’s biking opportunities here. 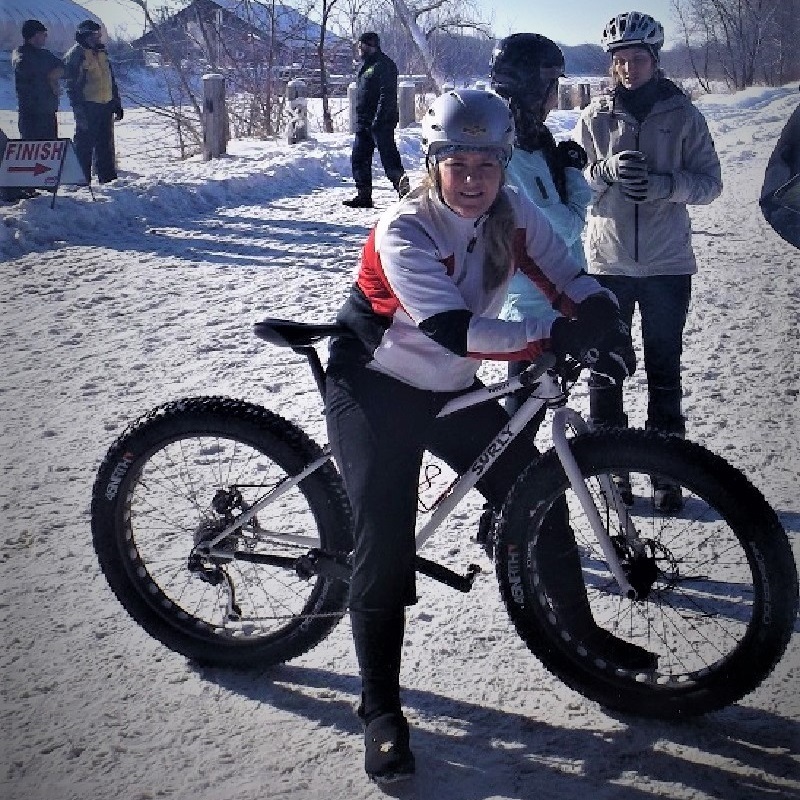 This entry was posted in News and tagged #mtb, bike Bloomington, bike minnesota, bike path, Bloomington MN, bloomington river trail, city/path, Minnesota River Bottoms, minnesota river trail, Minnesota River Valley, Minnesota trails, MORC, mountain bike, river bottoms, river trail, save the river bottoms on January 17, 2018 by Andrew Ellis. I just hope that the trail remains as wild and free as it presently is. There is an alarming prospect that there may be pavement on the trail in the future. There are plenty of paved areas that are ridable, let’s leave this one as it is!